It’s no secret that Riverbar & Kitchen is one of our fave spots in Brisbane for a cocktail, and it’s not just because of their riverside views. With tipples like their Rosé Spritz, salted caramel espresso martini and lychee mojito to pair with avo and kingfish tostadas and polenta fritters, it’s impressive we ever manage to pull ourselves away. 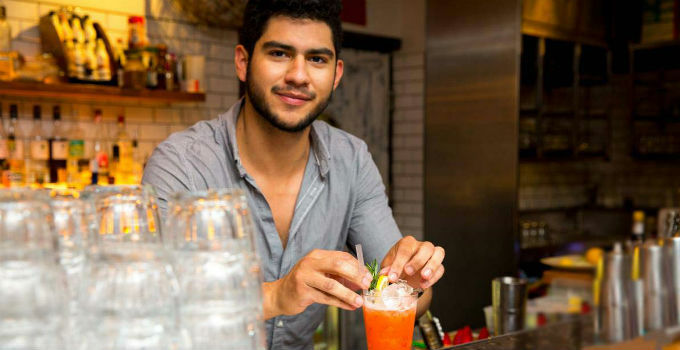 In charge of coming up with those tipples every season is bar manager Eduardo Rendon. 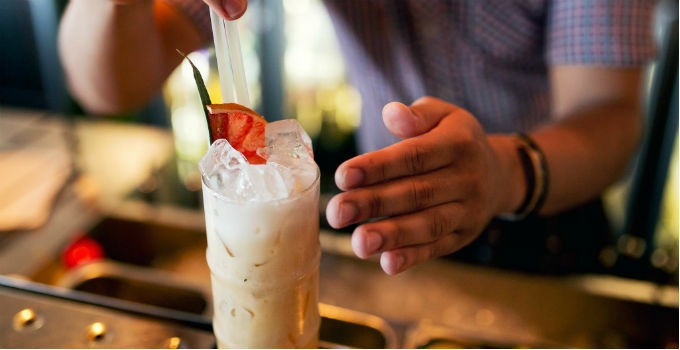 In the hopes of getting some tips we could use at home, we had a chat to him about crafting the perfect cocktails – and what a bartenders favourite drink really is. How long have you been behind the bar? I’ve been working at Riverbar for about 2 years and behind bars for nearly 5. How do you come up with new cocktails for Riverbar? It’s usually a collaboration between myself and Solotel group bars manager, Jeremy Shipley. We create a new cocktail menu each season, as seasonality is a really big thing for drinks as well as food, so we have a new menu for spring, summer, autumn and winter. In summer, it’s all about fresh, fruity and light flavours and drinks, while in winter, there’s more focus on richer, darker flavours. In every cocktail, I think the most important thing is synergy between ingredients, and balance to make sure that one ingredient doesn’t overpower another. You want the flavours to work together, but balance each other out. So when I’m creating a new cocktail, I tend to pick one ingredient to start with, whether it’s a spirit, a liqueur, or a fruit, and build around that with flavours that work together. We also try to use ingredients that are seasonal, and if we have a surplus of something we’ll try to include that, especially in our cocktail of the week. What makes an amazing cocktail? I’m going to give a really politically correct answer and say it’s very subjective haha. Everyone has different palettes so what I may like, other people may not like, but essentially it’s all about balance, so as long as the flavours are harmonious and have a punch to them, you’ll have a good cocktail. Plus, drinks have to look engaging and fun. I like a boozier cocktail than most, you know, a bit more alcoholic than your average pina colada – but I also like pina coladas. Every bartender secretly loves pina coladas they just don’t like making them haha. What spirit do you best like to work with? Personally I like gin, rum and whisky – I worked in a gin bar for quite some time, and got to use some really amazing gins, which was quite interesting, but I have always loved whisky. And rum is also super versatile, you can create some really good boozy drinks, but it goes well in summery cocktails too. Are you seeing any interesting trends in the cocktail world? Everyone’s dehydrating garnishes at the moment – but it does look really good and is also so much easier than crafting garnishes on the spot. Everyone is also getting really into using different herbs and vegetables in cocktails, not just fruits. I think people are also getting really chef-like in the way they make cocktails –everyone is making their own sodas and bitters and taking the house made approach to ingredients, which is really cool. We’re currently working on a chocolate banana foam for one of our new cocktails next season, which should be pretty good. We also do a monthly barrel aged cocktail each month which helps flavours develop a bit more – we’ve got a barrel aged Manhattan on the board at the moment. What trend would you like to see disappear? It’s not really a trend, but there are a lot of people out there who just won’t try new things – the people who say ‘Oh I hate tequila because I had it at a party once when I was 18 and can never touch it again.’ I would just like people to be a bit more open minded and trust the bartender, and be willing to try even simple things like cocktails with egg white in them. Got any tips for people mixing up cocktails at home? There’s a lot of literature out there – just flick through a book, or get an app! And always start with high quality ingredients, and use fresh ingredients. You don’t need a whole bunch of equipment or more than 3 or 4 ingredients to make a good cocktail – even just infusing sugar syrups with a cinnamon quill or using a jam instead of sugar, or making changes to basic recipes can make something really unique and amazing. That said, try to stick to the recipes as best as you can, but also have fun with it! It should be about having fun and socializing, you don’t need to take it too seriously. Probably having a good impact on someone else’s night out – a bartender can really affect the atmosphere in a bar. It’s also awesome to be a part of everyone’s night out, even if I just happen to be getting paid for it. I’ve been working weekends for 7 or 8 years but I really don’t feel like I miss out on anything working Saturday nights. And you get to meet some really interesting people. What do you drink when you’re on the other side of the bar? Beer and whisky. I do enjoy cocktails but there’s a time and a place for them – you know, places like Maker or The Gresham are awesome for a cocktail – and Riverbar, of course – but if I’m at a party or a craft beer bar, I’ll get a beer. It’s nice and simple haha. What’s coming up on Riverbar’s next cocktail menu?